Who wants a leaky deck? Who wants to be strolling around their garage looking for an umbrella during a rainstorm and get an unwanted shower? Not me. Not you. Not the deck waterproofing contractors at Prestige Deck Coating. At Prestige, we use a virtually invincible 6-level waterproofing system that stands up against even the heaviness of downpours. The key to eliminating leakage and to insure deck waterproofing is the 1st level: the corners. “Secure the Perimeter!” What that means is securing the perimeter. Like in sports or warfare, when you secure the perimeter, nothing can get out, it is trapped. The same is true for waterproofing your deck. At Prestige, we eliminate any possibility for water to escape and give you that unwanted and untimely shower. We take waterproofing seriously. After we secure the perimeter of your deck with proper flashing installation, water on your deck has only one place to go: in the drain. To execute this vital waterproofing goal, we use only custom fitted and situational specific metal flashing. Both on the deck surface and high up the walls, the 90-degree flashing is cut and fabricated to adhere to your deck in a seamless fashion. 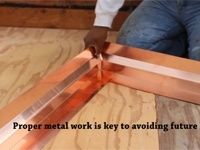 It is fastened tight to the floorboards and walls studs with industry grade power staples and galvanized deck nails. We at Prestige Deck Waterproofing, secure your perimeter. This is waterproofing-level one. “Batten down the hatches!” How will this insure deck waterproofing, you may ask? Great question. 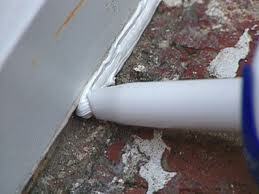 Once the flashing is securely in place, snuggling the deck corners/wall joint, out comes the sealant. We use only top-notch industry grade waterproofing sealant, and we spare no cost to provide our customers with a flush and firmly adhered perimeter. Any overlaps in the flashing are caked with sealant to maximize waterproofing capability. Then we smooth out the lines for an added aesthetic flair, that doubles as a flat surface on which to lay the next layer of the waterproofing system. The team at Prestige double and triple checks your deck’s perimeter to insure that no pin-prick hole is overlooked! This is the necessary preparation for the next crucial level of our waterproofing system: the 2.5lb. diamond shaped galvanized metal lathe foundation. The secure perimeter is waterproofing-level one. The team at Prestige is knowledgeable and courteous, and up to the challenge of giving your custom deck a long, dry life.